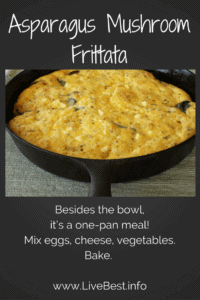 A frittata is a mixture of eggs, cheese, and vegetables or meat. This one-pan meal is a great way to repurpose food like this Asparagus Mushroom Frittata recipe! If you fish you need the right rod for the right fish and the right fly for the time of day, time of year, and nearly every other variable you can imagine. I saw this first hand as my husband continued to switch flies as we spent a weekend catching and releasing. If you knit, you need the right-sized needles and the right yarn weight for the pattern. Like most endeavors, the right equipment makes the task easier. This includes the kitchen. One of my must-have tools are quality pots and pans. In my ideal kitchen, a heavy bottomed 10-inch skillet, a 12-inch skillet with a lid, an 8-quart pot, a 3- or 4-quart saucepan, and a Dutch oven line the shelves. If they are made of high-quality stainless steel, these pieces are virtually indestructible and can go from stove to oven to dishwasher. They can also be expensive investments. I think they’re worth the investment because they last for a lifetime. They’ll also help you be a better cook because a thick-bottomed pan distributes heat well so food cooks more evenly and is less likely to burn. You can see more of my kitchen equipment must haves on the Products tab. Speaking of cookware, do you cook with non-stick pans? They are great for flipping a pancake or sliding an egg onto a plate. But that non-stick finish demands special care. Excessive heat and scratching the surface damages the non-stick coating, which causes it to crack or flake. A nonstick pan needs something to cook, so the manufacturers suggest not using a shot of aerosol spray oil or cooking “dry” in it, like toasting rice. 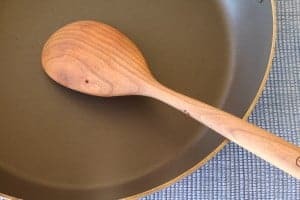 The preferred and recommended way to use a nonstick pan is with a thin coat of oil, fat, or liquid added after the pan has heated for a couple of minutes. Low to medium-low heat is best for non-stick cookware. Metal utensils scratch the surface, so use wood or heat-resistant spoons, spatulas, and tongs for stirring and turning. I use a wooden spoon my dad carved from cherry wood (pictured above). Thanks, Dad! 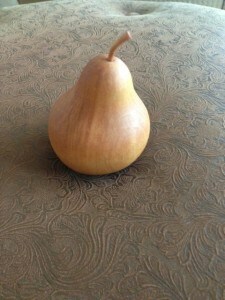 He also carved this pear! For clean up, non-stick should not go in the dishwasher because high heat and harsh detergents corrode and dry out the surface. Rather than the dishwasher, wash in warm, soapy water and avoid using abrasive cleaners, hard brushes, or metallic scrub brushes – they scratch the pan. I use a non-stick skillet or a cast iron to make a frittata. Besides the mixing bowl, it’s a one-pan meal! 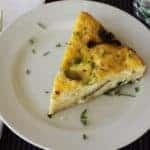 A frittata is a mixture of eggs, cheese, and other ingredients, such as vegetables or meats. It is very accommodating. If you have tomatoes, toss some in. Leftover pasta is a great addition. Asparagus, mushrooms, peppers, spinach, or herbs? Yep, they all work in a frittata. A variety of cheeses can be used, such as Parmesan, ricotta, feta or goat cheese. Plus a frittata may be served warm or at room temperature. With a green salad, on the side, you have dinner. Now you see why frittatas are a go-to recipe for me! 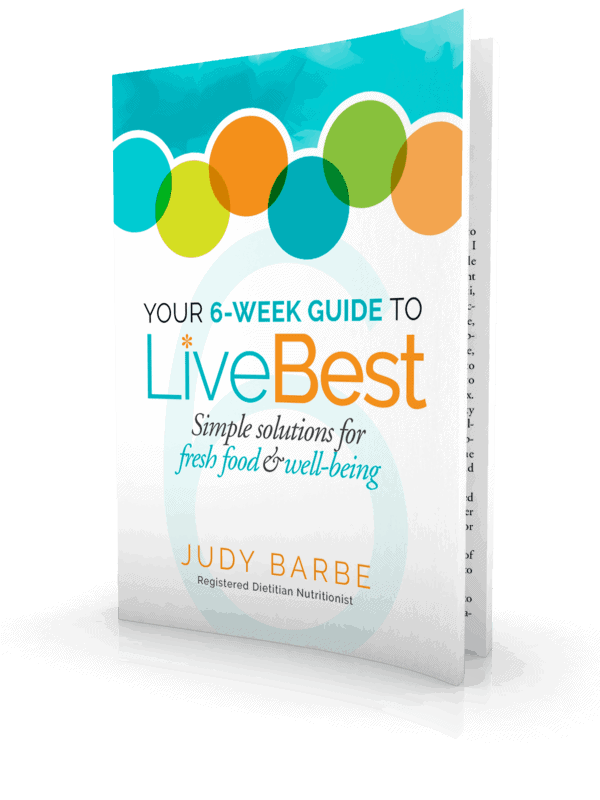 Here’s another LiveBest frittata recipe. 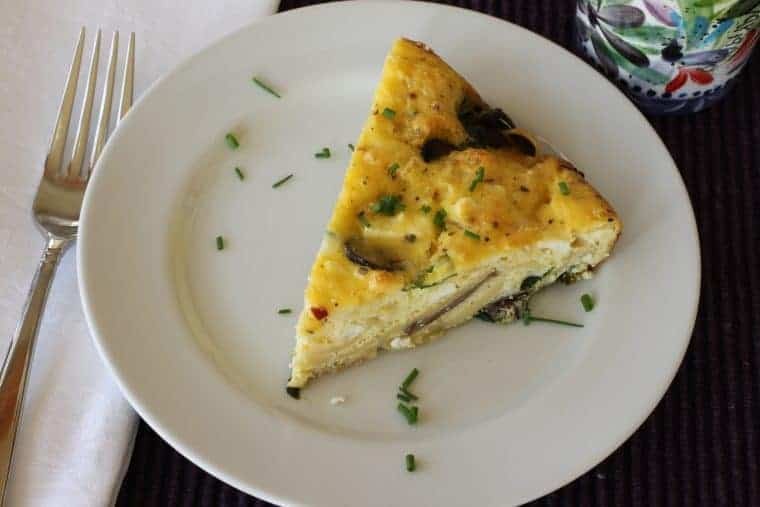 A frittata is a mixture of eggs, cheese, and vegetables or meat. This one-pan meal is a great way to repurpose food like this Asparagus Mushroom Frittata! Melt 1 tablespoon of the butter and oil in an ovenproof skillet over medium-low heat. Add the potatoes and cook without stirring, about 6 minutes. Turn the potatoes over cook 6-8 minutes more. Melt the remaining butter in a small dish in the microwave. Let cool slightly. Meanwhile, whisk the eggs in a large bowl, stir in the vegetables, cheese, melted butter, salt and pepper. Sprinkle the flour and baking powder over the egg mixture and stir just until mixed. Pour the egg mixture over the potatoes and place the pan in the center of the oven. Bake until frittata is browned and puffed, about 40-45 minutes until a knife inserted into the center comes out clean.